In addition to updating its consumer line of desktops with new Mac mini and iMac models, Apple on Tuesday also gave its high-end desktop an overhaul. The revamped Mac Pro sports Nehalem versions of Intel’s Xeon processors and a new system architecture, along with a starting price tag that’s $300 cheaper than before. The Mac Pro comes in two models—a 2.66GHz quad-core machine that costs $2,499 and an eight-core model with two 2.26GHz quad-core Xeon chips for $3,299. Build-to-order configurations include a $500 2.93GHz Xeon for the quad-core model and two 2.66GHz (priced at $1,400) or two 2.93GHz processors (priced at $2,600) for the eight-core Mac Pro. The Xeon 3500 and 5500 chips that power the two models come from Intel’s Nehalem family. Nehalem is the code-name Intel has given a new micro-processor architecture that features on-chip power management and a memory controller that’s integrated on the processor for faster access to data stored in memory. Apple says that each processor features an integrated memory controller with three channels of 1,066MHz DDR3 memory that drives up to 2.4 times the memory bandwidth while cutting memory latency up to 40 percent. Chips with the Nehalem architecture also feature a technology called Turbo Boost, which manages processor speed for each of the chip’s cores. If you’re performing a task that only takes up one or two cores, the Turbo Boost technology shuts down the idle cores of the processor while boosting the speed of the active ones. Apple says a 2.93GHz Mac Pro can achieve speeds of up to 3.3GHz using the Turbo Boost technology. Apple says Nehalem processors also support hyper-threading, which lets two threads run simultaneously on each core. That means an eight-core Mac Pro offers 16 virtual cores recognized by Mac OS X. A bidirectional connection called QuickPath Interconnect gives the processors in the Mac Pro quick access to the disk, I/O, and other subsystems in the machine. Finally, the new Xeon processors in the Mac Pro feature a 64-bit architecture and 8MB of fully shared L3 cache. Apple says that translates to fast access cache data and better performance. “The Nehalem processors implement a truly optimized quad core design,” David Moody, Apple’s vice president of Mac hardware worldwide product marketing, told Macworld. Each model comes with Nvidia GeForce GT 120 graphics with 512MB of GDDR3 memory. Apple says the new graphics provide three times the performance of the previous system. Graphics options include a $200 ATI Radeon HD 4870 upgrade. Users can also add up to four Nvidia GeForce GT 120 cards. The interior of the Mac Pro has also been redesigned. According to Tom Boger, senior director of Mac hardware product marketing at Apple, the interior of the machines are now easier to access. The processor and memory slots are now in a sliding tray and there is more finger room to add and remove hard drives. In addition to a 2.66GHz Xeon processor and Nvidia graphics, the $2,499 Mac Pro features 3GB of 1,066MHz DDR3 memory with the ability to expand up to 8GB; a 640GB Serial ATA hard drive running at 7,200 rpm; an 18x DVD-burning SuperDrive with double layer support; four PCI Express 2.0 slots; five USB 2.0 and four FireWire 800 ports; and support for Bluetooth 2.1+EDR wireless connectivity. The $3,299 model ships with 6GB of RAM. It also features a 640GB hard drive and 18x SuperDrive, plus the same slots and ports as the 2.66GHz Mac Pro. Both configurations feature a MiniDisplay Port and DVI port. Apple says the new Mac Pro exceeds Energy Star 4.0 requirements and is an early adopter in the industry for Energy Star 5.0 compliance. 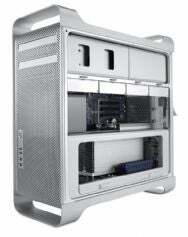 The Mac Pro enclosure is made of recyclable aluminum and the interior is designed to be more material-efficient. The Mac Pro uses PVC-free internal cables and components, and contains no brominated flame retardants. The new Mac Pro achieves EPEAT Gold status. “We’re committed to designing and building the most environmentally friendly computers in the PC industry,” Moody said. It’s been more than a year since Apple last updated its Mac Pro offerings. That January 2008 update was highlighted by the addition of two then-new 45-nanometer Quad Core Xeon 5400 processors running at speeds of up to 3.2GHz. The standard configuration of the previous generation of Mac Pros featured two 2.8GHz quad-core Xeon 5400 processors; 2GB of DDR2 RAM; a 320GB hard drive; and a 16x SuperDrive. Jim Dalrymple contributed to this report. Updated at 6:42 a.m. PT to include more information on the Nehalem architecture as well as more details on the new Mac Pro configurations. Updated at 7:09 a.m. PT to include more information from an interview with Apple executives.